The Boston University Summer Theatre Institute is a five-week conservatory experience for highly motivated high school theatre artists. 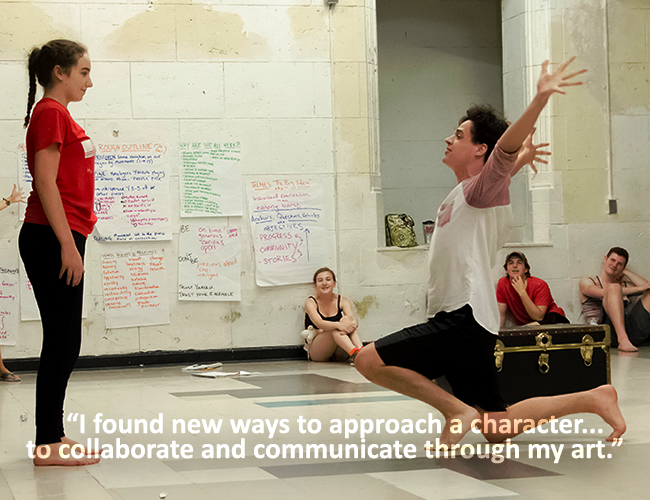 Designed to mirror the freshman BFA experience within the College of Fine Arts School of Theatre at Boston University, the Institute allows all participants the opportunity to test their interests and abilities in a professional training environment. Students earn 4.0 college credits for their coursework in acting, design, voice, singing, and stage combat, as well as master classes, experimental theatre laboratories, and the creation of an original piece of theatre with members of their ensemble. Throughout the five-week program, students engage with Boston University, the professional artistic community in Boston, and the cityкs historic and cultural offerings. Students graduate from BUSTI having honed their technique, depth of intellectual and artistic questioning, playfulness in collaboration, and ability to tell a dynamic story through the theatrical medium.